Your Companion and Hellbent will be lining up against each other in PvP. With the new guild PvP feature we won't have to bother with queue's anymore, we can just slug it out in the arena of our choosing. There will also be a few other events that we have planned like going for some world PvP achievements, some capture the flag style games in bases and more. The 15th of December will be cancelled due to the release of patch 5.10 but will pick up the following week. New Patch 5.10 is out! New world. New dailies. New gear. New bugs. We still are calling out for applications for more Officers! If you are interested please apply here! Hard Mode Operations Training runs are on alternating Tuesdays and Fridays for those who are wanting to learn them, so make sure to check the time in the events page and show up! If you are looking for a HM/NiM raid group to be a part of please make sure to check out the Raid Teams page to see if there are spots available! We are still looking for more officers so if you are a member and are interested please sign up here! In case you missed it you can read the Update Patch Notes for 5.9.2a here. We're forming up a group for Ancient Threat, if you are interested please sign up here or send me a message ingame or through discord! Emmilash is leading Hard Mode Operations Training runs for those who are wanting to learn them, so make sure to sign up in the events page! This week is a crafting week for conquest. Good luck! We've got quite a few new recruits and we are glad to have you guys with us! :D Please make sure to read the Guild Rules and see who are the GM & Officers in case you need to contact us! For those that have alts in the guild but don't use them: you can put them in the alt guild which has a flagship, guild bank, legacy hold and cargo hold. 5.9 was bumped to be released on August 7th, so coming soon! We have our leaders for the second HM Training Operation which should be starting up in a couple weeks! The vote has been counted and the days will be on Fridays. When they are about to start up we'll put them on the calendar! We hit #10 on the Large Yield conquest board. Congrats to the winners! We are calling out for applications for two Officers! If you are interested please apply here. We are also looking for a HM Training Leader, if you are interested please apply here. We are looking to set up a second HM training run! We need your opinions on when the best time would be for you all so please vote here! Welcome to all the new recruits! Please make sure to let us know if you need anything or have any questions! Please make sure to check out the Guild Rules! 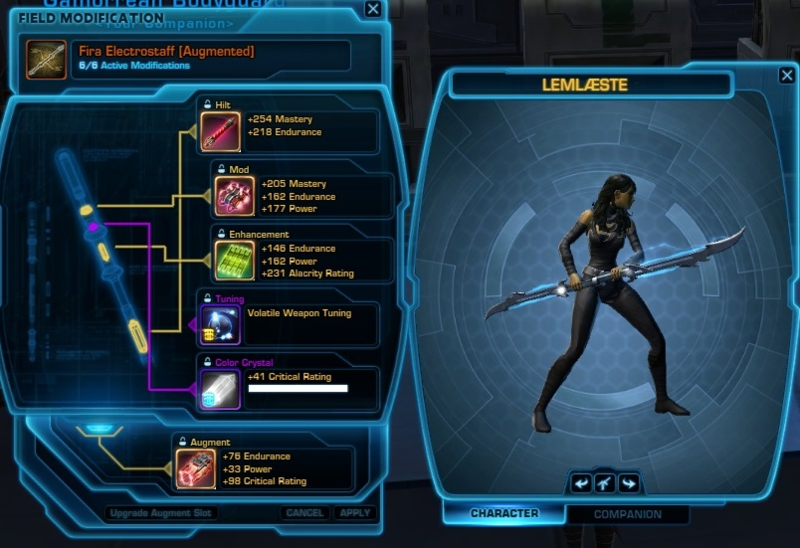 The changes made to the Cartel Market can be seen here at SWTORData. You can get access to Darth Hexid Alliance Alert by completing this achievement: With A Little Help from My Friends under Legacy. We are looking for people who are interested in killing the Dreadful Entity in TFB 16man HM's secret boss! If you are interested please sign up here in the forums! 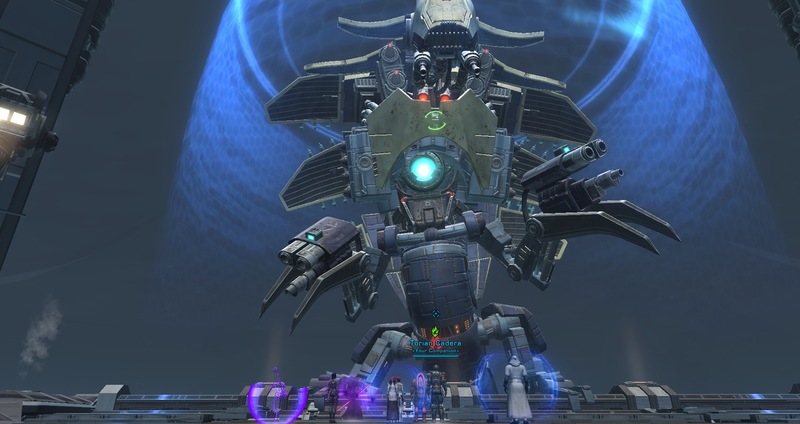 Saurryn is leading Hard Mode Operations Training runs for those who are wanting to learn them, so make sure to sign up in the events page! We hit #4 on the Large Yield conquest board. Everyone put in quite the effort (: congrats guys! If you are looking to join the guild please make sure to join our custom chat and see if someone in that channel can throw you an invite. You can also whisper any of the officers, generals or lieutenants should you see them online. A reminder for those that missed it: We have created an alt guild with the same name (Your Companíon) where we are placing our unused alts in there, if you have alts that you just do not use very much and can have them in the alt guild please let an Officer, General or the GM know. Congrats on those that beat HM Izax! You can read the SM guide here (written by Erunian), read the HM guide here (written by Rugles) and watch the HM 16man video here. There will be a new fp: Nathema flashpoint with 4 main boss encounters with new companion drop based on an ad, decos and a new armor set (in MM). It has been said they will be putting out a new Rishi Stronghold, we'll see! Emmilash is leading Hard Mode Operations for those who are wanting to learn them, so make sure to sign up in the events page! We are going to hold doing conquest prizes for a month to see how the new conquest goes. Recruitment is still currently suspended. 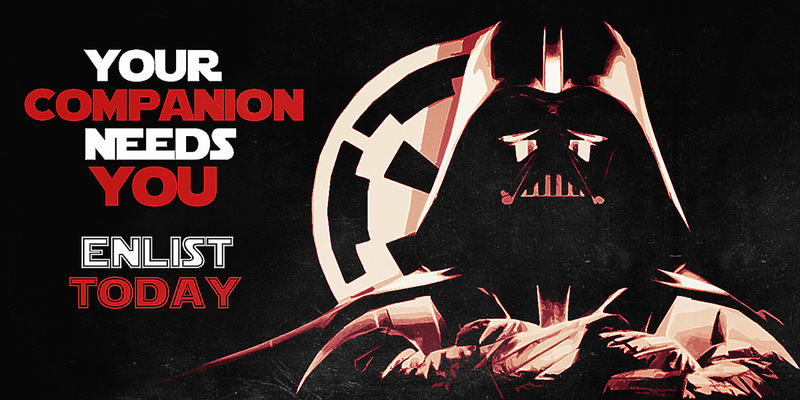 If you need someone to be invited please message a raid leader, Officer, General or GM! Congrats on those that beat Izax! You can read the SM guide here (written by Erunian) and watch the SM video here. There's a dev post on the upcoming changes for Conquest in 5.8a, you can read them here! Congrats to the winners! This week has been really weird but we made it on the board.